The Florilegium Program’s upcoming exhibit, Botanical Art of the Sonoran Desert: Past and Present , will display a wide variety of botanical art, from exceptionally detailed scientific drawings to what is best described as floral art. This range of artistic intent, from botanical illustration to botanical and floral art, can be seen here in these three portrayals of the Arizona queen-of-the-night cactus. Lucretia Hamilton’s Cereus greggii var. transmontanus is a scientific illustration intended to complement text written by a botanist. This type of botanical drawing involves magnification of various portions of the plant and presentation of cross sections to better reveal the plant’s structure. With botanical illustration, absolute accuracy and detail are foremost in the artist’s mind. The boundaries between botanical illustration and botanical art begin to blur in Margaret Pope’s Peniocereus. Accuracy and fine detail are present, but they are not the primary focus of the piece. By setting the plant in its natural habitat instead of looking solely at its separate parts, the artist gives the viewer a greater understanding of the plant: this is a night-blooming plant, and there is as much going on below ground as above. 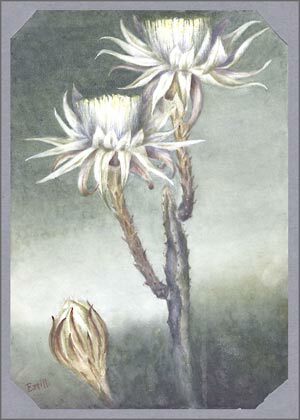 Ella Estill’s painting of Cereus greggii falls within the botanical or floral art category. It is a naturalistic and identifiable rendering, but its purpose is evocative rather than descriptive. The artist’s sole intent is to show the beauty of luminous white flowers against the night sky, something that a scientific botanical illustration could not do. 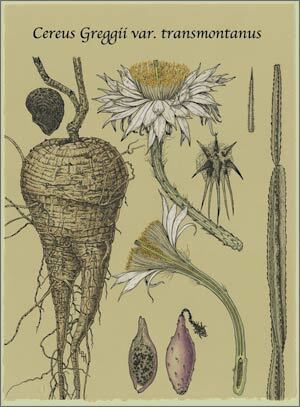 Botanical Art of the Sonoran Desert: Past and Present will be exhibited from August 24 to October 27, 2013, in the Arizona-Sonora Desert Museum’s Ironwood Gallery. This appeared in the July 2013 issue of The Desert Breeze, the monthly newsletter of the Tucson Cactus and Succulent Society.